Laughing Stock Theatre Company's Camp Little Laugh and the nexStage Theatre's Summer Stages Camp are theatre camps that children might remember forever. Camp Little Laugh is the Laughing Stock Theatre Company's summer sleep-away camp held at Cathedral Pines, north of Ketchum, from Aug. 6-12 for grades 3-10. The cost of the seven days and six nights of camp is $875 and scholarships as well as payment plans are available. Camp Little Laugh is a traditional camp experience with the addition of the performing arts, and includes classes in mime, improvisation, acting, art, dance and music. This theatre camp also offers recreational games, hiking and evening campfires, and Cathedral Pines' close proximity to Easley Hot Springs allows for lots of swimming fun. In the evenings, campers will enjoy competition in lip-syncing, perform skits, attend campfires or have fun dancing. A Grand Finale performance will take place on Friday, Aug. 12, with a family and friends barbecue. For more information and to reserve a spot for Camp Little Laugh, call 726-9124. The nexStage Theatre's Summer Stages Day Camp will take place at the Community School in Sun Valley for its first two weeks. The final week will take place at the nexStage Theatre in Ketchum. A final free performance will take place at the nexStage Theatre on Friday, July 22, and every age group will have a performance for family and friends. This theatre day camp will focus on the theatre arts on and off stage. Kids will participate in classes that will include designing and creating sets, costumes and props. In addition, classes in performing arts will consist of acting, improvisation, art, stage combat dance and music. Professional theatre artists will lead classes. Age-divided groups can decide whether to choose a script or write their own. 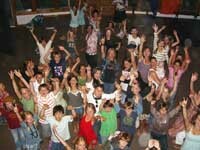 The camp provides a venue for young people to exercise their imaginations and grow in wonderful and unexpected ways. The camp will take place from July 5-22 for ages 4-7 from 9 a.m. to 12:30 p.m., and for ages 8-16 from 9 a.m. to 3 p.m. The cost for ages 4-7 is $425 and for ages 8-16 is $650. Scholarships and payment plans are available. A $100 deposit is required at registration. For details and reservations, call 726-9124.